For sale from stock 1 UFO 290 variable speed 220volt. 35 % discount. Gone is gone. Special Discount only ONE 290 VS 220v in stock. Normal price 3425.00.00 discount € 1000.00 Sale price in Ireland and UK € 2226.00 excluding VAT and Shipping. Order now! Use Best price quote button to place order. Klindex Ufo countertop polisher the portable planetary machine to polish counter tops and stairs. Klindex Ufo countertop polisher is a manual planetary polisher. 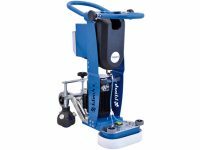 It is the ideal machine for grinding and polishing counter tops, stairs, edges and narrow areas. It has a powerful motor in combination with the counter-rotating planetary. These make it possible to grind and to polish marble, granite and concrete. It out perform all others machines on the market with its robustness and its perfect balance. The speed of the abrasives has been designed to make the machine stable. This makes the grinding and polishing operations easy . It is supplied with a splash guard and a connection for a vacuum cleaner. • Grinding and polishing stairs and edges. • Grinding and polishing marble, stones and concrete. • Making antique finish on marble, stone and wood. a tank, splash guard and kit velcro pad holder. Ufo, Tank, Pad holder, Complete set of Jaguar Flex Diamonds, Trolley. choose from 290mm or 330mm working width with variable speed. See table below.